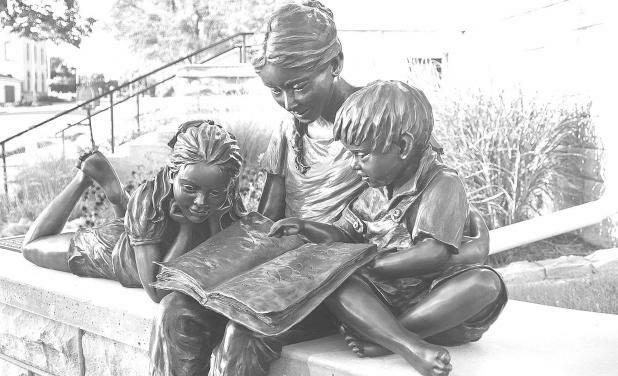 A gift to the Lincoln Carnegie Library, through matching funds from the Friends of the Lincoln Carnegie Library and Frances Lopata, the new sculpture is entitled “Story Time for Three,” and was dedicated Saturday, Sept. 22, 2018. The bronze sculpture by Rosalind Cook of Colo., was installed recently on a limestone platform constructed by Schwerdtfager Masonry to match the existing limestone library sign platform. A bronze plaque honoring the Lopata’s for their generous support of the Library through the years is attached atop the base. Speaking on the front lawn to more than 30 supporters, Jim Gabelmann told of Steve Lopata’s love of reading and his lifelong advocacy for literacy. Pam Morgan, who was instrumental in discovering the work of Cook, explained how the project was accomplished and presented a book from the sculptor to Library Director Mary Andersen. (Exerpted from Lincoln Sentinel-Republican. Photo by Kris Heinze).